Landless Gentry: Review Harris Tweed Scarfs Handmade by Ten 10 Creations on the Isle of Skye! Review Harris Tweed Scarfs Handmade by Ten 10 Creations on the Isle of Skye! Harris Tweed has over the last decade been finding it's way into more than just sports coats and men's suits. I have noticed (and enjoyed) its being incorporated into everything from Home furnishing fabrics to tennis shoes to stuffed animals and must say that it brings a touch of class to every application I've seen. Used in combination with leather fittings, it makes a great material for wallets, shoes and travel bags ladies purses, etc. If you think you like the look of tweed, but don't necessarily want to take the plunge into sports coats or whole tweed outfits, accessories made of the Harris Tweed are a great way to incorporated the look and classiness of Harris Tweed without fear of looking like a cast member from Downton Abbey (not that that would be a bad thing - you could do a lot worse!). And if you are a dedicated tweed fanatic such as myself, it's a way to keep our favorite cloth close at hand. One company committed to the worldwide proliferation of this wondrous cloth is Ten 10 Creations. They specialize in men's pocket flasks (I can see one of these babies in my near future), messenger bags, backpacks, ladies purses, tote bags and wonderful scarfs (the later which I am featuring here). 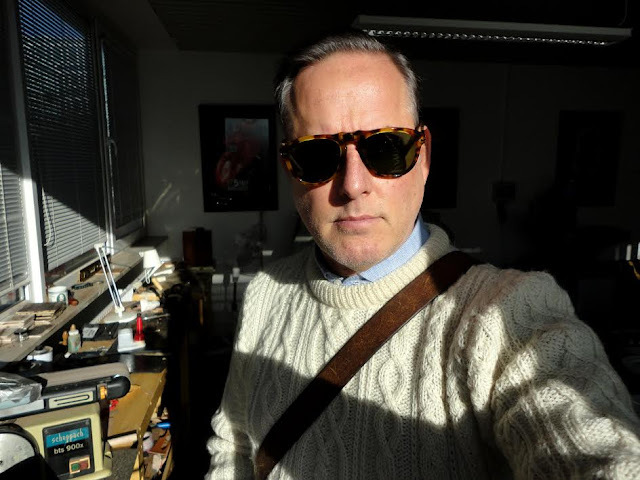 Indeed, any number of small, well priced accessories that have been ennobled by the decorative addition of my favorite Harris Tweed can be found at Ten 10 creations, finely crafted and ready to add a bit of dash to any gentleman's or lady's accoutrement. All are handmade by the good people of Ten 10 Creations, on the beautiful Isle of Skye, Scotland with the utmost attention to detail. While the light beige herringbone with orange and blue overcheck is was the first scarf I purchase from Ten 10 Creations a few years ago and is still my favorite, it's always a good idea to have variations in color to incorporate into different outfits so I've also purchased the grey check and the green herringbone. Now I will admit that these scarfs are a little scratchy when compared to some butter-soft lambswool and cashmere scarfs I have, but they are all ten times as stylish as those and well worth a break-in period for the style they offer. I hand washed these in Woolite last year and noticed they became much softer after as well. 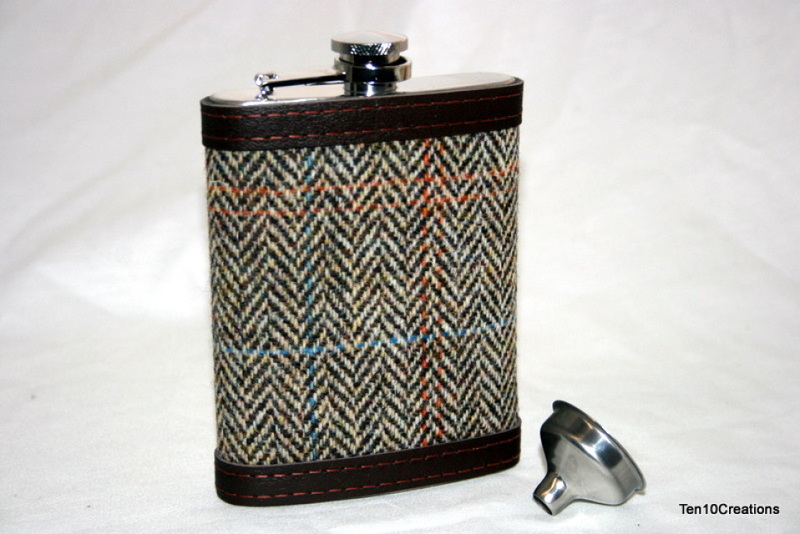 Of course being true Harris Tweed, they are also quite durable as well. Ah, the Isle of Skye, is there anywhere on this beautiful blue planet of ours that conjures up a more idyllic environ for our favorite cloth to be made into accessories that we treasure? Harris Tweed is woven in the Islands of the Outer Hebrides, just a short hope to the West from the Isle of Skye. The Isle of Skye - is all rugged coastlines, rocky spires, ancient stone circles and impossibly green hills and dales. And 'windswept', what description of this Isle could possibly be complete without the use of the word 'windswept'? I imagine our friends at Ten 10 Creations sitting back, having ended a long day making our beautiful accessories, tippling a dram of Talisker whiskey (which originates on the other side of the Isle - a mere half hour's drive away) by a glowing fireside. With the quiet confidence of knowing that they have spent their day helping to spread the passion for the good cloth and to them I raise my glass in gratitude!